Flaxseed has many benefits and various applications including food, animal food, and others, which includes personal care, painting, varnish, linoleum, and oilcloth. The North America flaxseed market is anticipated to exhibit significant growth over the forecast period, owing to the rising health awareness and increasing demand for omega-3 fatty acids. Increasing health awareness, increasing demand for clean label, and increasing popularity and consumer demand for vegan ingredients are factors anticipated to drive growth of the North America flaxseed over the forecast period. Demand for flaxseed from the food processing industry is growing steadily and can be attributed to the various health benefits associated with its consumption. To understand and assess the opportunities in this market, the report is categorically split into three sections, namely market analysis, by flaxseed type, application, and country. The report analyzes the North America flaxseed market in terms of market value (US$ Mn) and volume (Tonnes). In the same section, PMR covers the North America flaxseed market performance on the basis of consumption in terms of value and volume, respectively. This section includes PMR’s analysis of the key trends, drivers, and restraints from the supply and demand perspective. Impact analysis of the key growth drivers and restraints, based on the weighted average model, is included in this report to better equip clients with crystal clear decision-making insights. The next section of the report analyzes the market on the basis of flaxseed type and presents the market size in terms of value and volume over the forecast period (2016-2022). The milled (ground) flaxseed segment accounted for 68.6% revenue share of the overall flaxseed market in 2015 in terms of revenue, followed by the flaxseed oil segment. The milled (ground) flaxseed segment in the North America region is mainly driven by the health benefits of milled flaxseed consumption, especially in case of heart diseases and diabetes. The section that follows analyzes the market on the basis of application and presents the market size in terms of value and volume for the forecast period. The food segment is expected to expand at the highest CAGR of 3.1% in terms of value during the forecast period. In terms of market share, the animal food segment accounted for 63.7% revenue share of the overall market in 2015 and is expected to dominate the overall market during the forecast years. The food segment contributes almost one-third of the total revenue in the North America flaxseed market currently. The section that follows analyzes the market on the basis of country and presents the market size in terms of value and volume over the forecast period. 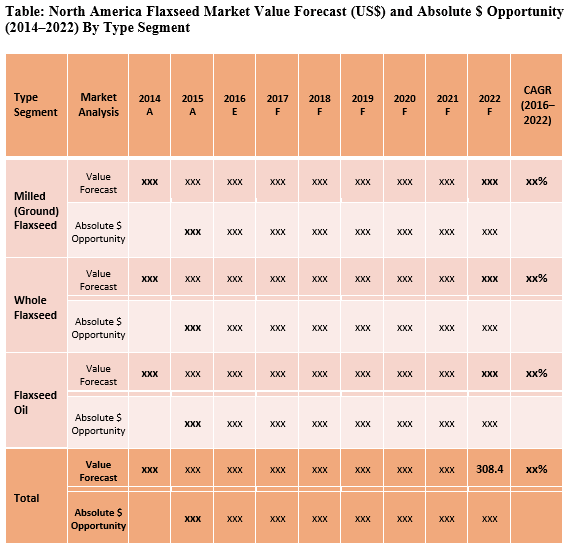 In this report, the North America flaxseed market is tracked from the consumption point of view in terms of both value and volume. The North America flaxseed market is anticipated to grow from US$ 250.5 Mn in 2015 to US$ 308.4 Mn by 2021, expanding at a CAGR of 2.9% in terms of revenue during the forecast period (2016–2022). Increasing health awareness, increasing demand for clean label, and increasing popularity and consumer demand for vegan ingredients is anticipated to drive the growth of the North America flaxseed over the forecast period. Demand for flaxseed across the food processing industry is growing steadily and can be attributed to the various health benefits associated with flaxseed consumption. Some of its benefits include lower cholesterol levels, lower risk of heart diseases, and improved digestive health. Growing consumer preference towards a healthy lifestyle is further fueling the growth of the flaxseed market currently. One of the major restraints for the growth of the flaxseed market are that flaxseed contains only Alpha-Linolenic Acid (ALA), but does not contain Eicosapentaenoic (EPA) and Docosahexaenoic Acid (DHA), thereby limiting its demand. Though a certain amount (typically less than 5%) of ALA gets converted into EPA, end-use industries prefer using fish oil as an ingredient in order to deliver the required amount of EPA and DHA in food products. This factor is anticipated to restrain the growth of the flaxseed market over the forecast period. In 2015, among the various product type segments, the milled (ground) flaxseed segment was valued at US$ 172.0 Mn and it is estimated to reach a market value of US$ 173.5 Mn by the end of 2016. The whole flaxseed segment was valued at US$ 28.8 Mn in 2015 and is estimated to reach US$ 28.9 Mn by the end of 2016. In 2015, the food application market accounted for 21.9% volume share of the overall market in North America, which is expected to rise up to 23% by the end of 2022. The segment is expected to expand at the highest CAGR of 3.1% over the forecast period, followed by the animal food segment in terms of volume. In terms of volume, the U.S. flaxseed market dominated the overall market in the North America region in 2015, and it is also expected to continue its dominance over the forecast period between 2016 and 2022, as compared to the Canada flaxseed market. In terms of value, the U.S. flaxseed market is anticipated to expand at a CAGR of 3.3% during 2016 to 2022, whereas the Canada flaxseed market is expected to expand at a CAGR of around 1.5% during the same period. The price of flaxseed is forecasted on the basis of the historic price trend and several other factors, including production, demand, import & export, and end-stock of flaxseed. Canada is the largest producer and exporter of flaxseeds worldwide. Export in Europe is expected to decrease owing to increasing supply from Russia, Ukraine, and Kazakhstan. However, export of flaxseed to Asia Pacific is anticipated to increase significantly over the forecast period. The U.S. mostly imports flaxseed from Canada and exports it to Europe. Key players in the North America flaxseed market include AgMotion Inc., Linwoods Health Foods, CanMar Grain Products Ltd., TA Foods Limited, Archer Daniels Midland Company, Stober Farms LLC, Heartland Flax, Shape Foods Inc., Healthy Food Ingredients LLC, Zeghers Seed Inc., and Bioriginal Food & Science Corporation. Bioriginal Food & Science Corporation.